Syfy announced today it is teaming with Oscar-nominated producer Bradley Cooper (American Sniper), Oscar-winning producer Graham King (The Departed, Argo) and Todd Phillips (The Hangover, Old School) to develop Dan Simmons’ Hugo Award-winning best-selling novel Hyperion as an event series. Cooper will executive produce along with King and Phillips. Itamar Moses (Boardwalk Empire) will write the screenplay and serve as co-executive producer. Universal Cable Productions will serve as the studio. Hyperion will be a production of Graham King’s GK Films and Bradley Cooper and Todd Phillips’ 22nd and Green. Set on the eve of Armageddon with the entire galaxy at war, Hyperion is the story of seven pilgrims who set forth on a voyage to seek the answers to the unsolved riddles of their lives. Each carries a desperate hope and a terrible secret — while one may hold the fate of humanity in his hands. 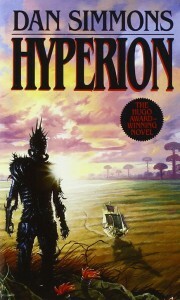 Hyperion is the latest high profile scripted project to be announced by Syfy; others include the recently-announced series pickup of The Magicians, based on Lev Grossman’s best-selling books; the 10-part series The Expanse, airing December 2015 and starring Thomas Jane; Arthur C. Clarke’s epic mini-series Childhood’s End, also set to premiere this December; Aldous Huxley’s classic novel Brave New World with Amblin Television; Gale Anne Hurd’s 13-episode thriller Hunters; David Goyer’s Superman prequel, Krypton; and Incorporated, a futuristic espionage drama from Matt Damon and Ben Affleck.